Culture/Date: Roman, 3rd – 5th c. CE? 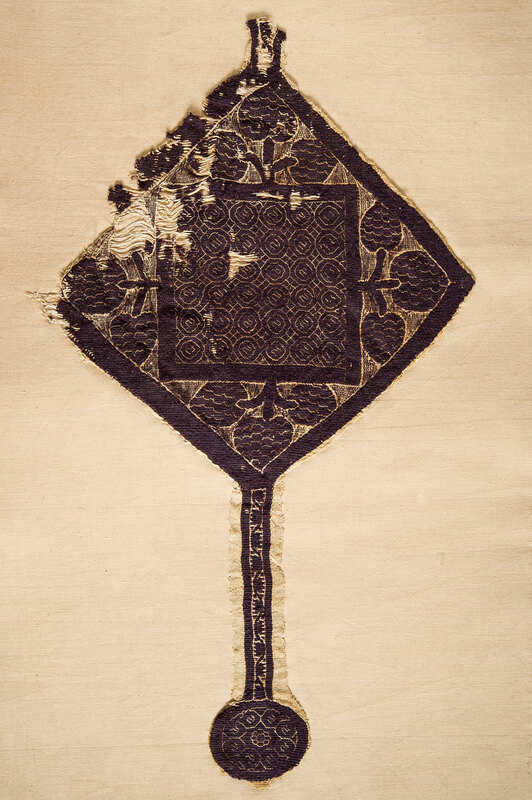 This pair of large decorative medallions appears to be a set and may have been cut from a single curtain, or a pair of identical curtains. From the accession numbers, it seems plausible that both fragments entered the Eton College collection at the same time. Furthermore, the close visual similarity of the pair suggests a connection between them. 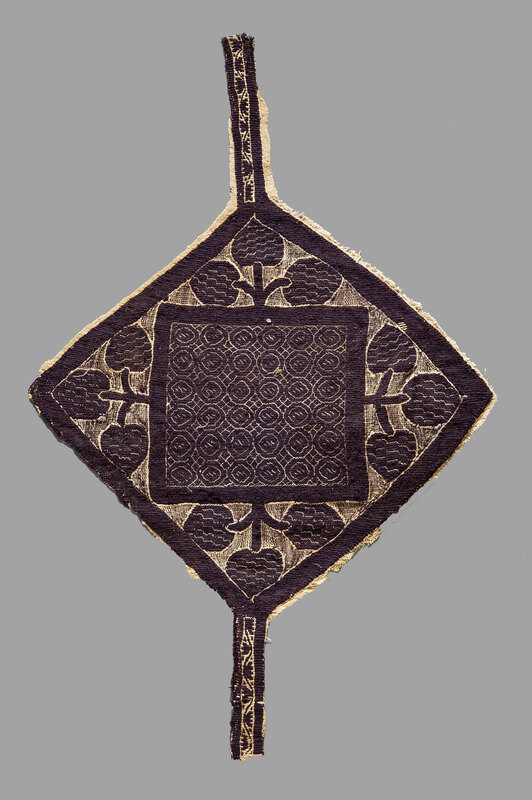 Both medallions take the shape of a large purple tapestry diamond enclosing a smaller purple tapestry square filled with a white geometric pattern. The four triangular spaces between the central square and the outer diamond are each filled with a purple, three-lobed, “tree-of-life” motif. The ground is an intermediate shade created by alternating weft threads of purple and white. Narrow bands embellished with an identical pattern of a narrow, curving vine with three-toothed leaves, branch off the upper and lower points of both large diamond medallions. On 6301 the upper band is mostly lost, while both bands survive on 6305. The lower band of 6301 preserves a finial medallion with a geometric pattern in delicate white thread that echoes the fill of the central square of each fragment. There are several small but important differences between these two fragments. First is a slight difference in size — 6305 is approximately 2 cm wider than 6301. Second is a slight difference in the fill of the repeating octagonal motif in the central square of each medallion. In 6301 these octagons are filled with a diagonal S-shape, in 6305 that S-shape is replaced by three small diagonal lines. These differences show the weaver (or weavers) making different choices as to the best way to translate the pattern from a drawing on papyrus to a finished textile. Similar, large purple and white decorative medallions in the collections of the British Museum and The Victoria and Albert Museum are recorded as excavated near the town of Akhmim in Upper Egypt.